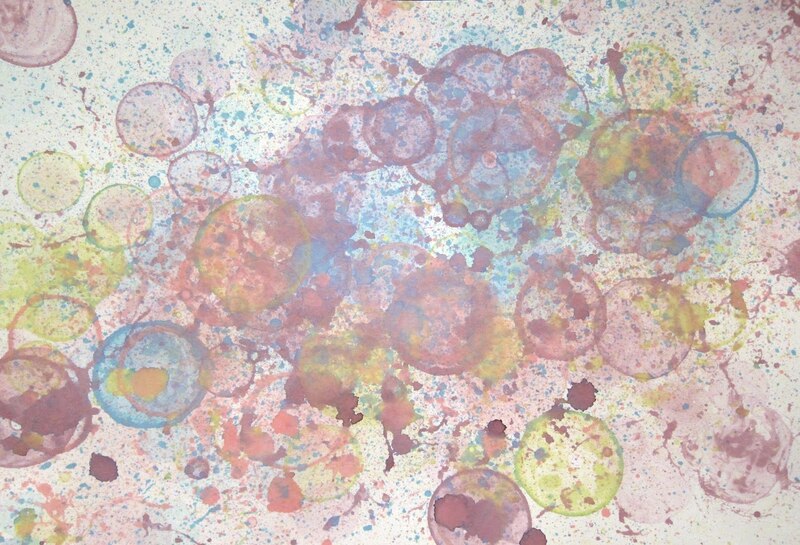 Art is Basic-- Art Teacher Blog: Bubble Prints! After experimenting with several ways of doing bubble prints, I think I found a way that works well. I poured some kids bubbles into small containers. Then, I mixed a few drops of food coloring into the containers. The bubbles were cheapo and weren't really bubbly, so I added some dish soap as well. Then, I blew bubbles just as you normally would blow bubbles and let them land on the paper. When they popped, they left these splatters and circle prints. I think they're cool. These would be cool backgrounds for further art or drawing. Before I found this way, I tried using tempera paints in bubbles and blowing with a straw and those ways were not very successful. If you've enjoyed this post, consider visiting my Affiliate Links!